Summary: Three sisters, three extraordinary, life-changing powers! My Thoughts: First off, I want to say that I loved Audrey,Wait! However I loved Audrey, Wait! 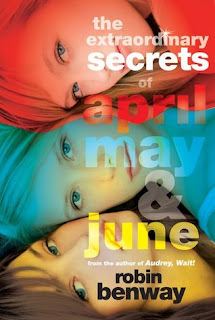 a little bit more than The Extraordinary Secrets Of April May June. I think that is mainly because it didn't jump around characters so much. In this story, we are introduced to three sisters April, May, and June. Each one has their own personality! Each one has their own story and problems. They also have their own qualities! They realize they share a little bit more than just being sisters. Each one can do something a little different than normal people. One can read minds, one can disappear, and one can see the future. Pretty cool, right? Not always. Just think about it. Would you want to know everything that is going on inside your sister's mind? Would you want to go invisible when your about to kiss a boy? Or what about seeing something happen that maybe you wish you didn't have too? I enjoyed this book a lot. It took me a while to get used to the girls. I would confuse them. Trying to remember who was dating which guy, who had which power. After a while though, it comes together nicely and you form a bond with each sister. I liked each of the side characters. And I especially liked the romantic interests, the boys! I liked the romance, the bonds of sisterhood, and the plot of this story. Its a quick fun read. Overall: Liked it a lot. If you have sister's you can totally relate to this book (I have 4 sisters). Cover: Love It! I've heard mixed feelings on this. Some people like the different colors, some don't. I am one of the ones who do. I think its pretty and makes it more appealing. Next time you order books, order this one along with Audrey, Wait! and be prepared to laugh. OK, this sounds like it has some elements that are worth reading, but I am not sure I really would like the confusion aspect. Enjoyed your review though and will maybe borrow this one from the library. I was glad to read your review. I just read and loved Audrey, Wait! I've been looking forward to the new one. I had not heard of this book before, but it sounds unique with 3 sisters with all different powers. Yeah, the cover is cool. Cant wait to get it!! thanks for the review, this sounds like a good book. wow you have 4 sisters?! thats gotta be cool!!!! Sounds like a cute book. Looking forward to adding it to my pile.